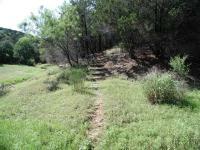 The trail begins on the shore of an inlet off of Lake Travis. Getting there: From Austin, head west on Highway 71. Turn right onto Paleface Ranch Road and head north. Turn right at the CR 404 and CR 413 intersection onto CR 404. Turn right onto CR 412 and proceed into the park. The Hike: When I set out to do this hike I had no idea what to expect. 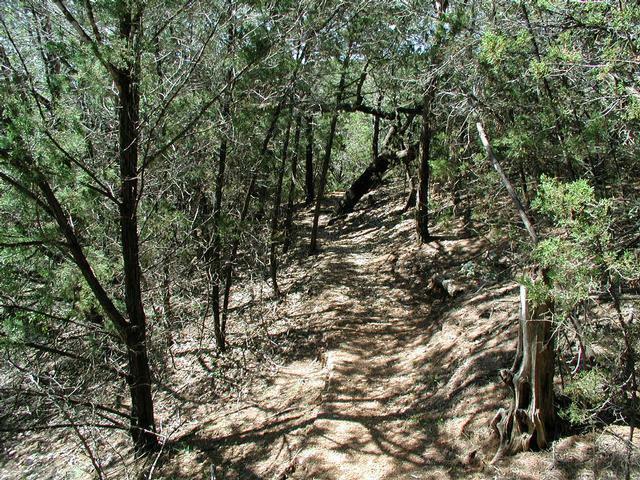 The LCRA's website indicated that there were trails in the park, but no maps seemed to exist online and I could find no other descriptions of the trail. So I was fully prepared to show up and discover that the trails were in reality just a short footpath between some picnic benches on the lake shore. Much of the trail is heavily covered by Cedar and Oak. Thankfully, I was pleasantly surprised by what I found. 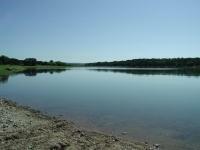 While short, the trail turned out to provide a few rough sections and great views of the lake. The trail begins at the waypoint "Trailhead" on the map and tends to follow an inlet from Lake Travis as it narrows into a creek. Passing along the flood plain of the creek I encountered a Cottonmouth snake just to the right side of this photo. At the waypoint "Y-R" the trail splits. Pick either route to complete the loop. On this day I kept to the right. But I paused at this spot for a few moments to observe a disturbed animal not far off the trail. A Cottonmouth snake was arched up, flattening its body to look bigger and opening its wide mouth, showing the telltale sign of the species. It made no movement towards me, but did hiss a bit when I did not vacate its personal space quickly enough to its liking. 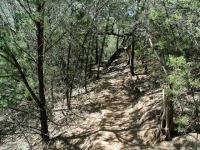 The trail turns rougher when it continues into the canyon of the stream that feeds into Lake Travis. 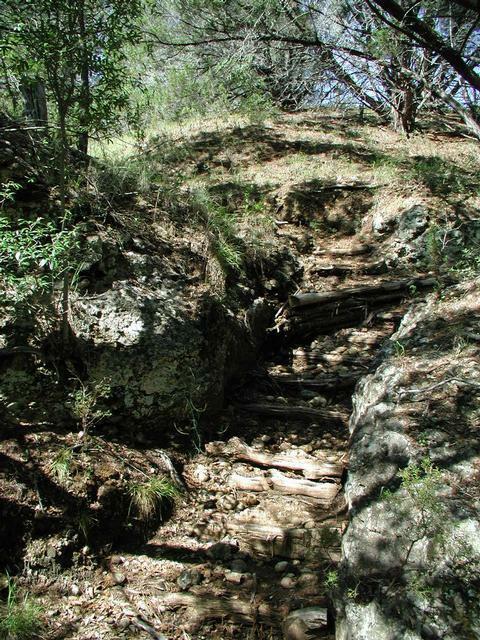 You'll gain a bit of altitude and cross the creek bed a couple of times before coming to a small waterfall at the waypoint of the same name. 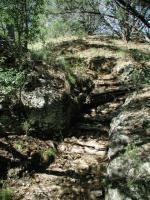 The path here gets even rougher as it scrambles up the small canyon to the plateau above. Inside the canyon the trail can get fairly steep in a few areas. 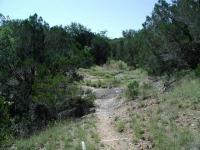 The hike through this point has been under heavy cover, with Ash Juniper and Oak predominating. While the top of the plateau is still mostly covered there are a few spots of pocket prairies that feature small patches of wildflowers. A short spur off of the trail leads to a jeep trail that appears to head to the lake according to the topo map. 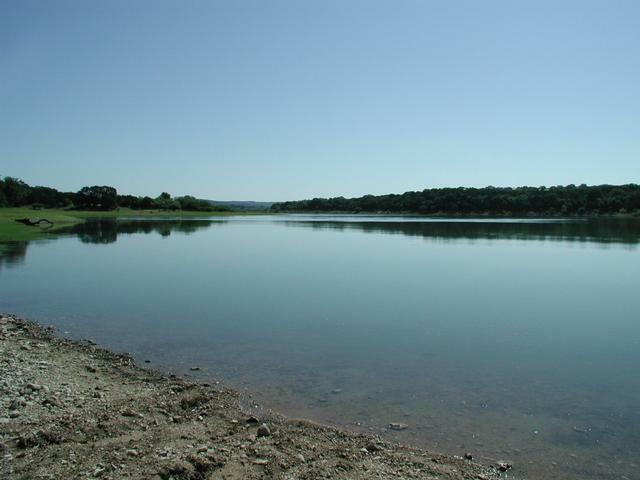 As the trail completes its loop and turns back to the west, it breaks from the plateau onto a ridge overlooking the lake. Several points along the trail provide great vistas overlooking the water of this lesser known cove. 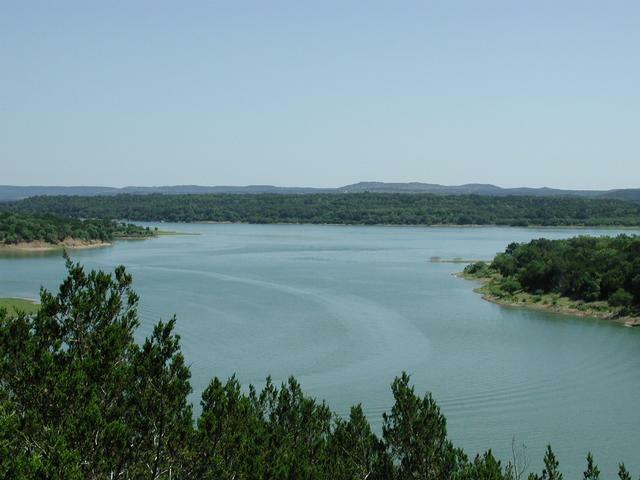 On this particular day the lower reaches of Lake Travis were probably choked with watercraft whereas only a couple were found here. The trail provides several great views of the lake. 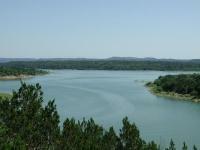 Here the inlet at Grelle empties into Lake Travis. Descending from the ridge and reaching the lake shore, the trail seemed to disappear. As I followed the shore and headed south to rejoin the portion of the trail already hiked, I found the trail, then lost it again. Eventually I just followed the contour of the lake/creek shore and walked through the high grass until I got back to the "Y-R" waypoint. From this point just follow the trail north back to the trailhead to complete the trek. During the course of this hike I saw only one other hiker, and only near the end of the hike. More common are the people on boats and personal watercraft who might be playing in the cove. Overall, this hike exceeded my expectations and I plan on returning to see if there's anything else that I missed the first time around. Went with my 5 year old and husband and it was a nice hike. After rains, it was quite muddy so wear appropriate shoes post-rain. Trail was well marked and loop was intuitive. We did not see a single other person. I did not know what to expect when I ventured out for this hike. 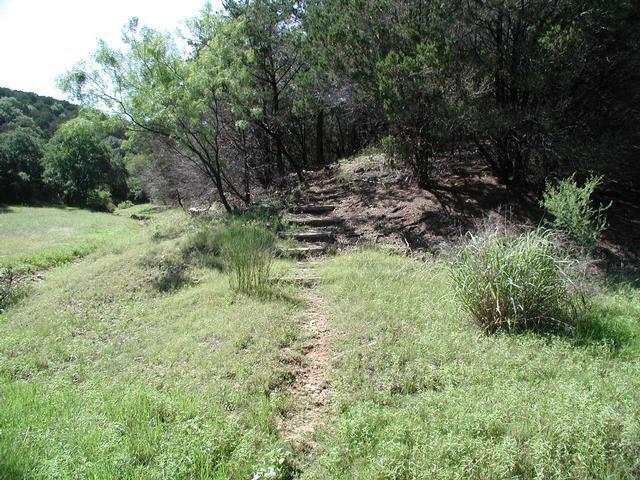 It turns out to be a fun hike that includes a few steep sections while paralleling a creek and flat sections with open pocket prairies and lots of wildflowers on the top of the ridge. Away from the lake shore the solitude is very good. I only saw one other person on the trail and this on a very nice Saturday. Finding the trailhead was a little tough. Go back to the lake shore and turn right all the way to the circle to park.